Principal Oatis and Assistant Principal Foyston will host an informal gathering in the Meany Cafe next Tuesday, April 2nd from 6:00-6:45 pm, before the Orchestra Concert. Come to meet our new Assistant Principal and have an opportunity to converse with both of them about school topics. Please join us on Tuesday, April 2nd at 7:00 pm in the Meany Gym for an evening of musical entertainment featuring Meany's orchestra ensembles — Cadet Orchestra and Senior Orchestra. Student musicians from some of Meany’s feeder elementary schools will also perform at this concert. It should be a lot of fun! We need a few volunteers to assist that evening — supervising students, running the video camera, and collecting donations at the door. Please contact Mr. Mosgrave if you can help. Congrats to the Meany Girls Volleyball team on their first win of the season last Saturday against Jane Addams! The schedules for all of our spring sports (Girls Volleyball, Boys Soccer, and Co-ed Track) are now posted on the SPS athletic page. Our Yearbook Club is hard at work putting together a fantastic product for students and families. We would still love to add more photos. If you have any pictures of Meany students inside or outside of school that you would like to submit, please upload your photos here. Use school code 7181 for Meany. The deadline is this Sunday, March 31st, so please get those photos in today! We now have a master plan and landscape drawings approved by Principal Oatis for the upcoming changes that will begin this spring in the small Meany courtyard garden, located outside the conference room and teacher lounge. This area will be reconstructed as an multi-use outdoor classroom with table space enough for a class to meet outside in nice weather and a "zen and sensory style landscaped garden" which will be used for the Special Ed department to help teach life skills to their students. The larger courtyard space which runs in the center of the school has been approved for a multi-use outdoor arts and outdoor education space. How that programming will look is still getting worked out in conjunction with the Art department, Special Ed and Ms Oatis but was approved by the whole staff. The vision is to have outdoor projects which involve as many students at Meany as possible most likely beginning next year, but possibly some of the outdoor arts could happen this spring. Huge thank you to 6th grade parent and Landscape Architect Jennifer Guthriewho has been working with Anna Davidson (7th grade parent) and Special Ed teacher Ms. Denenberg to create this large master plan and vision for the school. Fun Fact: Those two courtyard spaces have not been touched since the building was constructed back in 1962! GOOD NEWS! Your generous contributions to the Meany PTSA Annual Fund — from this school year and from last school year — are now eligible for matching funds. Many employers will match their employees’ donations to non-profit organizations. We have received the required documentation from the IRS, which means that you can reach out to your employers for matching funds for your donations, and for your volunteer hours in some cases. This is an easy way to multiply the impact of your philanthropic giving, and we hope you will take this additional step to help the Meany PTSA. Did you miss the PTSA meeting last week? Read the notes here. 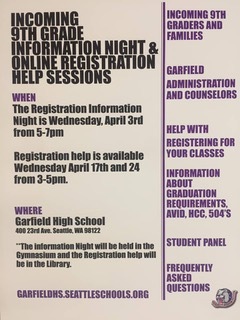 Wednesday, April 3 — Garfield High School Information Night (5:00-7:00 pm in the Garfield Gym) The Garfield High School Counseling Department and Administration would like to invite 8th grade students and families to come to an Information Night and Online Registration Help Sessions during the Month of April. Garfield Information Night Flyer. Thursday, April 18 — Option High School Fair (5:30-7:30 pm at Nova High School) For high school students looking for something more than a traditional high school, come to the Option High School Fair to learn about the variety of programs, smaller classroom sizes, flexible schedules, and unique learning methods tailored for each student’s personality and learning style to achieve success. Participating schools: Middle College, Nova High School, Seattle World School, Skills Center, South Lake High School. Questions? Contact the Office of Admissions at 206-252-0760. Option High School Fair Flyer. Wednesday, April 24 — 8th Grade Family Night (5:30-7:30 pm in the Meany Middle School Cafeteria) Meany and Washington Middle Schools are proud to team up again this year for an 8th grade Family Night. FREE catered dinner and FREE childcare, plus RAFFLE PRIZES! Staff and student representatives from Garfield, NOVA, Franklin and Cleveland High School as well as athletics, clubs, ASB and other organizations will make up the panel to answer all of your questions. Community organizations will also be present, including Coyote Central, Therapeutic Health Services, Atlantic Street Center, Treehouse, Country Doctor and many more. We can't wait to see you and help you and your student with the transition to high school! 8th Grade Family Night Flyer. Mr. Fields, our Family Advocate at Meany, has requested donations of low sugar/healthy snacks to provide to our Meany students who may be experiencing hunger during the school day. He has requested items like, granola bars, fruit snacks, single serve crackers/pretzels, assorted chips, trail mix, low sugar drink boxes/pouches, and frozen breakfast sandwiches (we have space in the school freezer to store these). If you haven’t had a chance to meet Mr. Fields yet, stop by to talk with him at the school. He is a wonderful resource for our Meany community! Read more about Mr. Fields. Donations can be dropped off in the school office labeled "PTSA/Mr. Fields". Please contact Jen Emrich with any questions. Green Plate Special - Grow, Cook, Eat! Generous financial support is available. We have a “Pay What You Can” policy for all of our programs. Learn more and sign up for Green Plate Special camps and classes. Questions? Please call 206-602-6845 or email classes@greenplatespecial.org. Do you have a school-related question or concern, but you’re not sure who to ask? Contact your Grade Level Rep and they will do their best to help find the answers that you need!